John Lester's Club-M YF-21 Kit Preview . The Japanime series, Macross, and its popular theatrical counterpart, Macross Plus, have some really exciting vehicles. One of the slickest is the prototype YF-21 - a super-advanced fighter that can morph into a humanoid mech. The story takes place in 2040, on the colonial planet Eden. There, the Ministry of Defense is testing two prototype transforming stealth aircraft, the YF-19 and YF-21, to counter alien incursions. Both "aircraft" are highly advanced - to the point where the pilots are linked directly into the computers via a neural net (thankfully, they don't have to think in Russian to get 'em to work though). Both projects are in danger - from Earth's super-secret, AI-guided X-20 aircraft, and from the intense rivalry between the lead pilots, Isamu and Guld. Club M's 1/72 scale resin kits of the -19 and -21 are hard to find and expensive (16800 Yen - about $140 USD - each, as of 1/99). I was able to pick the YF-21 up from Rainbow 10 shortly after another release became available. I'll say this for R10 - they are probably the fastest overseas hobby retailer I've ever dealt with - the order ws in my hot little hands within a week. Inside the sturdy box was a bewildering array of parts: 33 resin, 24 white metal, and two clear vacuformed plastic. The resin parts make up most of the fusalage, wings and control surfaces. 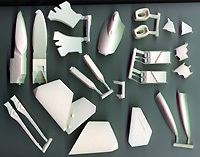 The white metal parts are mostly landing gear and engine afterburner "vanes", though there is also a somewhat shapeless white metal pilot figure. Colorful waterslide decals are included; all the markings I saw plus a huge array of stencils are on the sheet. Instructions and paint/marking guide are in Japanese - but are pictoral, so you can puzzle them out. If you have a copy of the Macross Plus video, you have all the reference material you'll need. 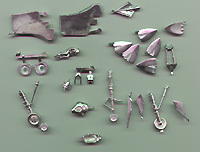 The quality of the castings is first rate on both white metal and resin parts. None had any pits, bubbles, or other surface defects. Flash on both was non-existant; even the pour stubs were tiny. From what I could tell by dry-fitting the pieces, very little cleanup will be required, and all the parts fit exceptionally well. Overall, I was impressed with the quality of this kit. Though it's pricey (you could get 10 ERTL Enterprise-C's for the same money! ), compared to almost every other resin/multi-media sci-fi kit I've seen (Starcraft's excepted) it's worth every penny. If you like the subject and you don't want to scratchbuilt ... and you have the coin ... I highly recommend it. Last updated on 8 February 1999.